International film-movie-star-actor Richard Gere has raised a cool $936,000 (£600,281) after auctioning off a much-coveted guitar collection that included a 1960 Gibson Kalamazoo Les Paul and a 1931 Martin D-28. The bidding took place at Christies' New York auction house last Tuesday (11 October) and the 1960 Gibson (pictured above, left) unsurprisingly proved the star of the 106-lot collection, attracting a winning bid of $98,500 (£63,141) from a private buyer in the US. 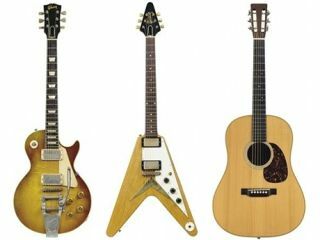 A 1958 Gibson Kalamazoo Flying V (above, centre), which was formerly owned by Albert Lee also attracted some massive bids, finally coming in at $74,500 (£47,756), again, to a private buyer based in the US. In addition, the C.F. Martin & Co. museum also made a couple of big acquisitions, winning the auctions on three of Gere's rare Martin acoustics, the most valuable of which, a 1931 D-28 (above, right), went for $62,500 (£40,064). The others, a 1901 00-42 Special and a 1944 000-28, went for $30,000 (£19,231) and $25,000 (£16,026), respectively. Other mind-numbingly unattainable highlights included a 1960 Gibson ES-335, which sold for $47,500 (£30,449); a 1958 Les Paul, which made $37,500 (£24,038) and a 1954 Fender Strat, which raised $25,000 (£16,026).